Continued from "Letters - flight training 1939-40"
Pilsen, April 12 1940: We are in for a change again, and it starts tomorrow. The bags are already packed; we are to spend two months entirely on our own at a camp in the Böhmerwald [Bohemian Forest]. It is supposed to be first rate living there, and we are already celebrating. For the pilot's license, I must train for at least another six months; the first solo flight is only the beginning. In the overland training I intend to cover long distances, as a sort of survey of Germany. But this is still a couple of months away, for we must still learn a great deal about navigation, and without navigation there is no flying. Most failures do not come from a lack of flying skills, but rather from inadequate ability in navigation, and with that everything stops at once. Really Willy, how are things? I am surprised that he didn't join the Flier-HJ if he was able to. Klattau, April 17 1940: We've had half a week here in Klattau, and I like it even if everything is fairly primitive. We are located about 7 km outside the city. There is only our group and a few people from technical personnel. Here, drill is greatly reduced, while duty periods are very tough. But here flying takes first place, which is quite to our taste. We get our post daily from Pilsen by a postal airplane. Yesterday was taken up with solo target landings from 2200 feet with the engine switched off. That was great fun. Klattau, April 25 1940: I haven't written for a long time, but that comes from the fact that for the last while we've had continual flight duty from 6 am until 8 pm. In addition, I've had sentry duty, and on the 20th an inoculation which left me shivering with a bad fever. On the 21st I finally made my high altitude flight. One and a half hours at 6,300 feet above ground level. I used the opportunity to fly over Pilsen and the Böhmerwald, until the time was up. On the 23rd we visited a village Neumarkt in our own special way, which is to say we made a rough landing on a village meadow, which made a sensation all about. The schools were closed, and so all the town children came running. The people were pressing so much against the airplane that we had to bring in border guards to control them. For us it was a treat to see German civilians again, for the people in Klatttau [Czechs -cy] are especially horrible and loutish to the soldiers. We have now completed the first part of our training, Class A, and have already started training on the heavier B machines. Today I shall make an overland flight in a machine of this sort. [Overland refers to landing in a different location than you started from -cy] Navigation in the Protectorate of Böhmen and Mähren [Bohemia and Moravia] is difficult because there are no distinctive lines or locations. You already know that I am promoted to lance corporal, retroactive to April 6th. The theoretical A2 examination now awaits; there is a lot to learn, and the load is especially heavy because we are on duty until dusk and have no electric lighting. We shan't be here much longer; after the flying skills, which we've already begun, we go back to Pilsen. "We visited a village Neumarkt in our own special way ... all the town children came running." "We have already started training on the heavier B machines." Here the Ar 96. Klattau, May 4 1940: It is of course hard for one of my old leaders who is still in Leoben. The most important man is Marek. Willy knows him. At the time, he led the illegal Hitler Jugend in Leoben. He also presented the first confirmation that HJ musters were held at our house. It had been raining for the last few days which naturally means no flying; in its place we drilled like demons. But we didn't let it get us down, and looked forward to flight duty all the more. We are currently training for solo flight skills. I really storm up into the air. Most people always enjoy this: spins, looping, sudden turns, etc. at 5000 feet in a Bücher-Jungmann. Formation flying with the heavy machines is less fun; one must be so careful to maintain formation that it is impossible to take in the scenery. Next week our theoretical examinations are due, and so far we have had no time to study. I doubt that anyone has ever been trained as quickly as we have been trained. Until now the B 2 training took an entire year, and even then one was still far from flying a Ju 52 ... that was something for a C school. I have still not flown an enclosed plane. My chilblains are quite cured, but the skin has all of a sudden started scaling on my ears leaving sores. It must be the result of some mild frostbite. In a recent comic event, I was flying an Ar 66 at speed, and wanted to hand-adjust the rear-view mirror on the upper wing. I reached up from the pilot's seat without thinking about the slipstream, which was so strong that my hand was struck backwards instantly. I have learnt to be more careful. Gilbert has written that he is also flying solo. Poldi took this picture while flying an Fw 58 over Klattau. Pilsen, May 24 1940: Another week has gone by since we returned to Pilsen. It is so lovely here that our airfield is hardly recognizable. Must also say that our beautiful 1-A flying days at Klattau are also past. When we got back we had a few theoretical examinations to get through. A flying technique examination is in the waiting. And I am not done with formation flying. For the moment the routine is one day flight duty, followed by one day of theory. You will have noticed that in all of this I am to cover the requisite overland flight kilometers. I flew with my flight instructor over Marienbad and Eger to Cham in the Böhmerwald, and then through the Fürth depression back to Pilsen. While flying, I had to show that I was able to continually track our progress by position and time. And as everything went well, on Wednesday I was given the job of flying a machine from Aigen to Pilsen. I was so happy to be back in the Steiermark again. Three of us were taken to Aigen in a W 34. There each of us took charge of a He 72 and off we went over the Alps. It was a beautiful but very cold flight over the Pyrn Pass, Wimdisch-Garsten, and Wels to Pilsen. That time I was in the air for two and a half hours, and yesterday I was sent up again, this time in an Ar 66 from Pilsen to Plauen in Vogtland, then over Ascha/Straubing to Ainring. This is the airfield which the Führer always uses on his way to Berchtesgaden [still today an important smaller airport in Bavaria -dc]. There I met others from our group who had also landed there. Unfortunately we had only two hours together as a storm was brewing over the Alps. Today I flew to Ainring over Braunau am Inn [Hitler's birthplace], then over the Böhmerwald, past the Großer Arber [highest peak in the Bavarian Forest] and over Klattau to Pilsen. I was quite tired, and had eaten hardly anything the whole day. Since we get a special issue of rations for every hour of flying time, and because, so far, out of simple haste I have left behind the on-board rations, today I was issued more than I could reasonably eat alone: a liter of milk, two eggs, chocolate, biscuits, 10 rolls, a double ration of butter, glucose and cream slices. In just two days I've covered 1100 km; if this continues I'll reach the target number all too quickly. We hear daily of the successes of our troops with enormous happiness and excitement, but are annoyed that in all likelihood we will not be sent into action, because it will still take some time to finish up here and then to go through our specialization training. Pilsen, June 7 1940: Unfortunately I was not able to write sooner. We have now all completed our overland kilometers. In the process I have traveled a lot. I've been in Breslau, then in Brünn. On May 28th I flew to Straubing (on the Danube), from there over the beautiful Thüringer forest to Gotha, then over Bayreuth, and finally from Gotha over Saalfeld back to Pilsen. Then the weather was so bad that we put in a few days of infantry duty. On June 1st I flew to Weimar with my instructor over Marienbad, Eger and Plauen in quite miserable weather. While I was there I met a flier from the same time at Köslin [Napola], who is stationed with Gilbert in Berlin. In the evening we went into Weimar together. The next day we flew back to Pilsen in the afternoon. On June 3rd I flew to Straubing, and then to Braunau am Inn, and back over Klattau to Pilsen. On June 6th after putting in a four hour flight, I had my examination in flying skills. And now we are to learn radio-navigation. When I use the radio, I work very slowly and carefully which reminds me of our days as recruits. I hope to complete the B 2 school during the summer holidays, but everything will need to work out well. If so, then perhaps I can get a couple of days' leave. Ainring, July 7 1940: You will be surprised that I am writing from Munich. I was very surprised myself to be sent here today, especially as we had been told that we would only be flying on tomorrow. So I have time to write, but I am without my fountain pen, hence the pencil. From June 20 to 30 we trained at an airfield in Cham in the Böhmerwald. Here we flew the whole day through, from morning 'til night, once even flying through the night until 4 am. This continued in Pilsen, with the difference that overland flights were added. One day my instructor and I set out for Klagenfurt, but the fog over the Alps grew so thick that we got thoroughly lost in our great two engine machine until we were able to make out Windisch-Garsten after the Pyrn Pass. From there we turned towards Wels. Once I made a very boring bad weather flight to Markersdorf near St Pölten. There we were grounded for three days by the weather. Flying these days is more fun than it was in the small machines; we now fly with a crew of four. The latest flights to Prien, Cham, Bayreuth and Munich have been “instruments only.” Naturally we always have an instructor on board with a radio. It is, of course, not very cheering when we are curtained in and can see nothing of what is happening outside. But according to our time table, we must take off in just this way. In this way we leave Pilsen in the early morning, make three or four stops through the day and usually get back to Pilsen about 8 pm. Then we quickly wash and eat, and fall into bed to be ready to repeat the performance in the morning. All the same this can't continue much longer; time must be set aside for theoretical instruction. Pilsen, July 1940: I should be very interested to know how things turned out for Willy in school. Today completes half a year since I returned from leave; Gerhard must have grown a lot. We are done with the flying part of our training and haven't flown in the last fortnight. Next week the theoretical examinations begin. Only there is no time for study, because we are always drilling; we even spent today, Sunday, racing about the countryside. On Saturday we were on duty until just before 10 pm. Any comparison between school here and Oschatz is laughable, but that's the way it is for officer recruits. We are to be finally posted on August 13th. Unfortunately we completed our training three weeks early, and now must wait until the time is up, consoling ourselves with drill. It used to be always so, that when the group finished up early, we could go on leave, but we officer recruits make a special case, we call ourselves the “penal colony.” We are happier about the the new posting where we shall at last begin our specialised training. 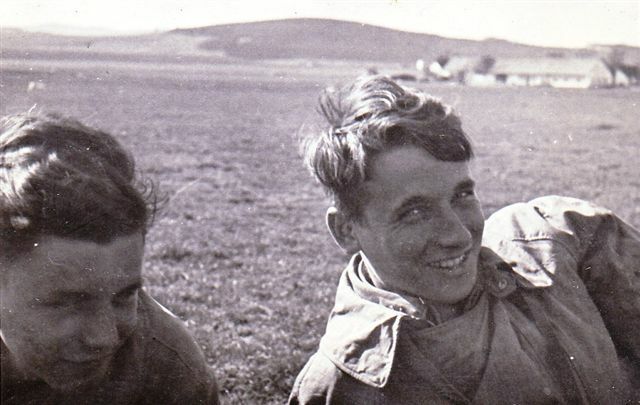 Pilsen, July 1940: Today I took my two last oral examinations (airplane engines and meteorology), and with that our group has completed its studies. That is to say, we are now the Luftwaffe's youngest military pilots. Over the next few days we shall be issued our pilot certificates. Naturally, I have already ordered a pilot's dagger from a firm in Berlin, and I shall be very happy when I can wear it for the first time. Now that we are done with the schooling we drill from morning to evening, longing for our marching orders and new postings (but these may take another two or three weeks). I am very anxious about where I shall be posted. I have applied for Stukas or fighters. I should much rather be able to spend the time at home, if the whole family were gathered together. Also, I was taken aback to read that Willy cycled the entire 130 km from Leoben to Bad Gleichenberg in a single day. That's a fine achievement for the young rascal. Pilsen, August 3 1940: Dear Dad, I write in great haste before going on duty. Thanks for your letter which came in yesterday. Except, to my horror, I got the letter as a personal delivery by the sergeant major himself, instead of through the post as usual, and got a tongue-lashing into the bargain. The point was that you addressed the letter to “Military Pilot ...”. Now that we are at war, there must be no written identification of anyone as cavalryman, rifleman, or airman, only the strict military rank, in my case lance corporal. So please, dearest Papa, write only to Lance Corporal L. W. etc. Pilsen, August 15 1940: Today I can share a pleasant bit of news. After 4 weeks of quite hard drill we had an inspection today and we have also been promoted to NCOs, and this, retroactively to June 1st. I can't tell you how happy I am about this, even though we had been counting on it. Now we are going about with our new uniforms, and it is an amusing feeling to suddenly become a superior of the other ranks. Together with the promotion, we have been told where we shall be posted next. I am to go to an airfighter school at Schwechat near Vienna, where I shall get my specialised training. Sadly nothing has come of the Stuka dreams. In spite of that I am glad to be sent a bit closer to home. Besides, it is perhaps possible, dear Papa, that you can come to Vienna with Mom, where we can meet. This evening we shall be stepping out with our officer supervisor to a bar in Pilsen for a farewell celebration. It will be our first evening outing on which we are allowed out with limits set according to our new rank: until 2:00 am. And tomorrow it is off to Schwechat. I am already curious to find out how my new quarters will look. Hopefully I shall not be disappointed. From now on, besides the regular pay, I shall be getting a professional soldier's salary. It is supposed to be generous; I shall let them surprise me. Schwechat, August 17 1940: (to Mom in Bad Gleichenberg) I don't know whether or not you already know that I have been transferred to Schwechat. It is still not certain whether we (I am here with 11 other officer recruits from Pilsen) are to stay here, will go on somewhere else, or even be able to go home on leave. I have been granted my first outing to Vienna: Sunday until 2.00 am Monday. The airfield is here in Schwechat, quite a distance away, with a station on the line from Pressburg to Vienna, and from which station I shall be most often travelling to Vienna. I am very glad to be out of Pilsen's wooden barracks. Here we have lovely stone buildings again, and I share my room with three others. I was in Vienna on Sunday and saw the Technical Museum there. We have been assigned a Fähnricht [Ensign] supervisor. He has talked of a steamer trip on the Danube, over Saturday and Sunday. Schwechat Fighter Pilot School with "lovely stone buildings." I am now promoted to Fähnrich [lowest grade in the Prussian officer hierarchy -dc] retroactive to the first of the month, and can now wear a portepee [part of an officer's kit in the form of a decorative looped cord with a large fob, intended to be attached to his dagger -dc]. I had been an NCO scarcely a month and so the promotion came as a great surprise. This time the order was announced directly by Reichsmarschall Hermann Göring and so was made effective a bit faster. It is really something the way so many of our instructors from Pilsen, who were still our superiors two months ago, must now produce stiff salutes for us. In the coming month we must be as good as done with our specialised training. Then I hope that we shall finally get a few days leave. It would certainly be good for all of us. I have already been retrained for the Me 109. This is a very fast bird. Schwechat, October 30 1940: Imagine my rotten luck: Saturday morning I get tickets for a Sunday evening performance of “die Meistersinger.” And now we are ordered back to base by 10 pm. Annoying because it would have been my first Wagner opera. 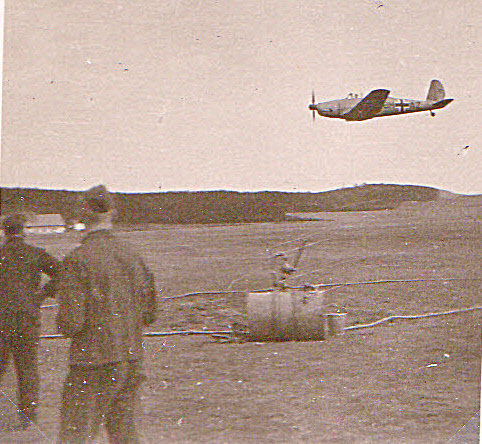 On Monday, that is, tomorrow, we shall practice firing from the air with the Me 109. This is a marvellous thing; I am already very happy about it. Flying the Me 109 - "a very fast bird." Schwechat, November 3rd 1940: On the 15th, on my first military anniversary there is to be a final inspection. What happens with us after that, no one knows. The three months in Schwechat have gone by so quickly, and I can scarcely believe I could find such a pleasant life anywhere. Schwechat, November 11 1940: On Wednesday November 10th I was given my pilot's badge. No need to say how happy I was about it. I wore it for the first time yesterday in an outing to the Burgtheater (“der Kanzler von Tirol”). Schwechat, November 13 1940: On Friday we set out for foreign parts. I am to go to Merseburg an der Saale near Halle. For what reason, I have no idea, and neither have I any great desire to be annoyed by my dear friends, the Saxons. Merseburg, November 17 1940: We arrived after a trip of almost 24 hours. The arrival reminded me very much of Oschatz, and also we were all unpleasantly disturbed when we saw the internal arrangements here for the first time. In Schwechat we had divine peace and quiet. Towards the end we were only two to a room, which was very pleasant in itself. The only thing that has pleasantly surprised me, is the casino which is grown very large. There is no hope of leave from here. It is also unclear how long we are to stay here; depending on circumstances, it may be for several weeks. The family enjoying Poldi 's two-day November leave in Leoben: little sister and brother, Gretl and Gerhard, and Mom and Dad (with bicycle). Photo probably taken by Willy. Merseburg, November 24 1940: [Surprisingly Bibi was, all the same, given another two days leave.] I arrrived here early, just after midnight. The trip went very pleasantly. I was only obliged to change trains once, and that was in Nuremberg. From there I caught an express. There was only two hours waiting time in the entire trip, and so I arrived here 15 hours early. It is a great annoyance that there is no later train to Munich. The NSV [National-Socialist people's welfare] was distributing sweet coffee and soup to the soldiers. So I started to eat my sausage buns, and to nibble at Mom's cake. Things have also changed a little here. Although I was only two days at home, it feels as if I had been with you just as long as last time. France, December 5 1940: [The final location could not be disclosed, but was surely in the environs of Le Havre. -dc] Our journey that began in the early hours of Sunday morning came to an end this afternoon. As you can imagine, I saw a great deal in this time. When our rations were distributed in Aachen I sent a quick note. I hope the card was also received. From there we went to Maastricht, then through Belgium, Liège and countryside. Here I saw the first traces of the war. The little I saw of Holland was very nice, while I didn't care at all for what I saw of Belgium. Then we traveled on through the night arriving in St Quentin at daybreak. One area of this city is entirely destroyed. Then it continued at an unbelievably slow pace -- mostly because so many bridges were out -- on to Compiegne, where we arrived at 4 pm and got fed. Here, the entire area about the station was completely destroyed. Naturally, I took photographs whenever I could, but the weather was almost always bad. I was happy when we got into Paris at 10 pm (December 3rd); we had all had quite enough of the train travel, even though we were in a 2nd class compartment. Sleep was scarcely possible. I spent the first night sitting; the next night I climbed into the luggage rack at once. In Paris we finally got proper beds and food from the Red Cross. On December 4th our train was only to leave in the afternoon, and, even though Paris is off-limits for soldiers, the Wehrmacht treated us to a thorough tour. So I managed to take in the most important sites in the little time we had: Napoleon's tomb, Place de la Concorde, Eiffel Tower, etc. We travelled through the night, and reached our unit at midnight. I stayed the night in a country house. We waited through the morning sitting over an open fire in the living room; in the afternoon we were travelling again. I am now located in a small town in Normandy in provisional, i.e. quite miserable, quarters. ...I have already been into the town this evening. It is in any event more agreeable than Merseburg. I don't know whether or for how long I shall be stationed here. As I write we can hear the bombers overhead, rumbling on their way to England. France, Dec. 20th 1940: My Dear Parents, The Christmas celebration is getting nearer, but we have not noticed it much here, for neither the weather nor the surroundings produce any sort of Christmas mood. It is still relatively warm here. The temperature stands at about 10° (centigrade) for days on end, so naturally there is no question of snow. We put some effort into finding a Christmas tree, but there was none to be had anywhere. We have been told that a few are still being sent from home. Duty is very agreeable and varied; most commonly we are on watch, waiting for the Tommy who never appears. Day by day I like this room better. Now I even have heating in three forms: hot water [radiators], warm air [ventilation] and an open fire. So the room is as cozy-warm as a bakery. The food is equally superior. Every day we even have as much wine as we please. One needs some restraint to avoid becoming a drunkard. I wonder if you've received all my letters, as I've written a good deal lately. Well, it's past midnight, so I must close. Dear parents, I wish you and my brothers and sister the merriest of Christmases; I shall be with you in spirit. Heartfelt greetings and kisses from Bibi. France, Dec. 28 1940: The Christmas festivities are over. We used a pine for our Christmas tree as nothing else could be found. I was the one who hauled the tree from 60 miles away in my truck. Now our Christmas Eve: our celebration was just for our unit. We started with our roast hare and the usual side dishes, then the famous Christmas stollen, and lots of apples, nuts, etc. There was wine, sparkling wine, beer and spirits until we were senseless, more accurately falling-down drunk. We also hired a band composed of men from the air-defence. “Father Christmas” appeared and distributed presents. Naturally I was thinking of you the whole time. We are a hour behind you so that as your tree was burning it was still broad daylight here. In general there was not much in the way of Christmas spirit. On Christmas Day 1940 Poldi is in the "Sitzbereitschaft" (readiness seat). On the 25th I was on observation duty again, which means being in position at first light, and staying outdoors the whole day. On the 26th I was in the military cinema ... and that's the way time goes by. As far as I can tell the French don't celebrate Christmas at all—I found a single shop stocked with cakes. Wine on the other hand can be had everywhere. So there have often been days—I confess it to my shame—that I've fallen into the feathers with a fuzzy head. As for everyday life and doings which Dad asks about: Basically I still have a lot to learn here, and must get used to the new surroundings. I had my first enemy contact on December 10th. This is how it came about: I was on observation duty and complaining because lunch was late, then I heard motors, and thought it was the truck bringing the food. I looked out at the window and suddenly saw bombs exploding. I was told that I said, “Those are really bombs.” At that point everyone was under cover; but then we raced out to the machines to “scramble” after the Tommy. But he immediately disappeared into the clouds over the Channel. We hunted him over the water for a long time, but he must have raced off like a poisoned ape. On the same day we chased another one, but it grew dark so quickly that we had to feel our way along the coast to get back to our airfield. Today I had another contact which had been spotted by a submarine. Naturally they didn't wait for us to catch up with them. Every night our position gets shot up, and the air-defence puts on a fine display of fireworks. It is unbelievable how much the people took Major Wick's death to heart. I was so happy to have been posted to his wing directly, and now I shall never see him again.